A MODERATE avalanche danger exists in the Turnagain Pass area today for wind slab avalanches, glide avalanches and cornice falls. Watch for fresh wind slabs to be forming in the 3-5" of new snow expected with moderate to strong winds. These slabs are likely to be around 6-10" thick and forming at the upper elevations. At the mid-elevations, glide cracks continue to release and limiting time under these is prudent. Last, give cornices a wide berth and limit time under them as well. Today is a day to watch the changing weather conditions and take inventory of the new snow amounts. There is a possibility this system could turn out to be a 'sleeper storm'; meaning we receive more snow than forecast. *If you are headed to the Summit Lake area don't forget to check today's Summit Lake Summary and click HERE for recent Summit Lake observations. CNFAIC staff would like to thank the individuals involved in last weekend's avalanche fatality near Eureka for their openness and willingness to share their story and photos for others to learn from. A detailed accident/rescue summary of the incident can be found here. A weak storm system has entered the Eastern Turnagain Arm region this morning. Snowfall has just begun and Easterly winds have just picked up. We are expecting 3-5" of snow today above 1,000' with rain below (this rain/snow line could creep up through the day and we could see more than 5" of snow in places). With this new snow and ridgetop winds in the 15-30mph range, we can expect shallow wind slabs to be forming. These slabs will be sitting on this past week's variable surfaces (sun crust, wind crust, soft settled powder). How well the fresh slabs will bond with the old surfaces will be the question today. 1) How much snow has fallen. 2) What are the winds doing. Are they transporting snow along the ridgelines? Are they loading slopes? 3) How well is the new snow/wind loaded snow bonding with the underlying surface? Quick hand pits can be good to suss this out. Cornice falls: As is the general rule, these are worth avoiding/limiting time under as they continue to break off. Today they will get stressed a bit more with new snow and wind. Photo below: Pete's North ridgeline from yesterday. Recent cornice falls can be seen along the ridge. 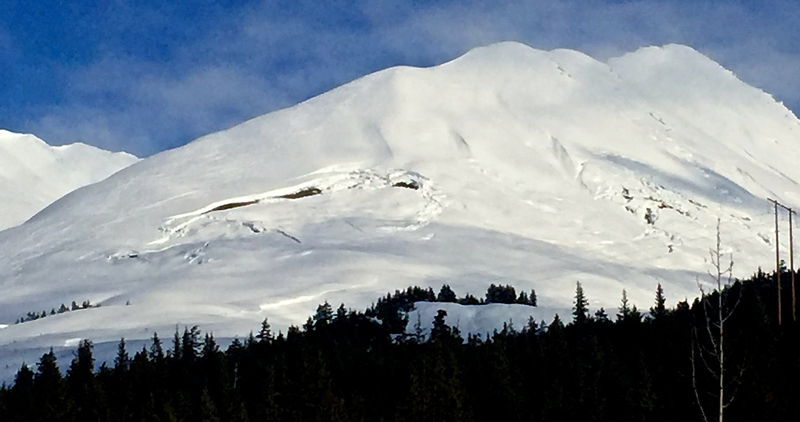 Although we have a short burst of snowfall and wind on tap today, glide avalanches remain just as much of a concern. This is due to the countless number of glide cracks in places folks recreate and the destructive nature of a glide avalanche in the event one does release. There were several glide cracks that slide yesterday in the Summit Lake area and one possible new glide avalanche in the Lynx creek drainage. All that said, it's worth keeping a lookout for cracks and minimizing time under them - no question! Photo from yesterday: Very large glide crack on the SW face of Cornbiscuit. You can see tracks on the looker's left of the 8-12+' deep crack. Partly sunny skies, with some blue holes, covered the region yesterday. A morning snow squall added a trace of snow at sea level in Girdwood (and a few inches in Anchorage - causing some driving mayhem) but this all missed Turnagain Pass. However, snowfall has started to fall this morning and as of 6am we have seen 2" accumulate. Winds during the past 24-hours have been steady averaging ~10mph with gusts to 20mph. Temperatures have been in the mid 20's F on the ridgelines and ~30F at 1,000'. Today we have a weak system moving over us from the East. This will give us a chance for 3-5" of snow with a rain/snow line between 1,000 and 1,500'. Temperatures should climb through the day and peak around 35F at 1,000' and the upper 20'sF on the ridgelines. Winds are slated to bump up to the moderate-to-strong category from the East along the ridgetops (15-30mph with stronger gusts). This system looks to exit this evening and tomorrow, Sunday, we should see party sunny skies with a possible snow shower here and there. Stay tuned.